Welcome back to Affordable Locksmith of Texas’s blog! If you’re new to our blog, welcome! We are your local locksmiths for Spring and The Woodlands area and on our blog we try to share tips for security, the history of relevant topics, and speak to current news that could affect your security! 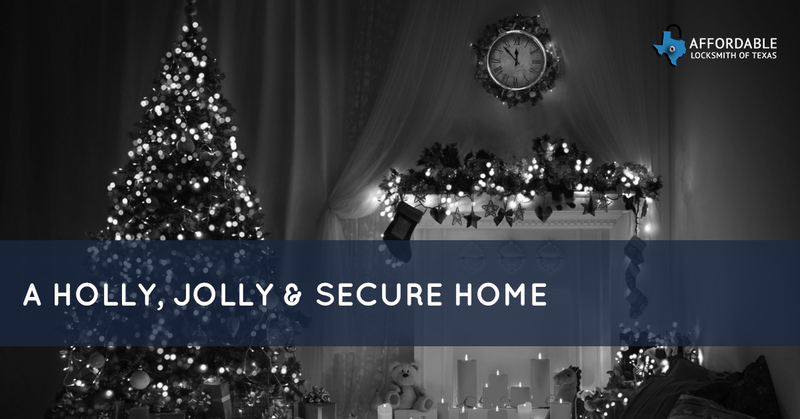 Today, we are going to take a quick break from our blog series to write about home safety during the holidays. If you are like us, we are excited for the most wonderful time of year. We will be decking our homes with twinkling lights of all colors, pulling out ornaments that are decades old, and baking eats and treats from our family’s traditional recipes. Whether you are staying in town for the holidays or visiting your family on the other side of the country, we hope you have a safe and wonderful holiday season. Keep reading to learn about safety precautions you should take. If You Are Traveling . . . If you are like the traditional songs states, going over the river and through the woods to grandma’s house, then you should take some precautions to make sure that your home is secure before you leave. Besides doing the obvious of locking your doors,securing any other entrances into your home, and pulling the curtains closed, there are a few other precautions that you should take. Set your lights on a timer. In most cases, those breaking into your home are looking for an easy target and a place that they will be able to break into quickly and leave undetected. Lights could give them away quickly and easily. Pause your paper and mail. You can also ask a trusted neighbor to pick up your paper and mail while you’re gone. Again, you want to make it less obvious that you are away. Install an electronic locking system. A keyless electronic system can not only easily put away the worries of a break in, but also, if you have it connected to your home’s automated system, can make sure that your house is locked from anywhere! If You Are Out for the Evening . . . If you are like many, there are parties galore to attend during the holiday month—work parties, school programs, and more. Even though you may be gone for only a few hours, it is still best to take precautions. Leave your lights on. Again, leaving lights on and even keeping the TV or radio on can give the appearance that you are still home, even when you might be enjoying a classy night with your coworkers or supporting your child at their Christmas program. Leaving your lights on can also helpful as you walk into a home allowing you can see who is and isn’t lurking inside. Lock your doors. This probably seems like an obvious thing to do, but it’s often forgotten if you’ve never had a problem in the past. As we said before, those looking to break in and steal that big screen that you’re gifting your husband for the holidays are looking for an easy break in and an unlocked door is inviting to a thief. Close your shades. One of the easiest ways to avoid a break in is to not advertise what you have to offer. Even though it can be tempting to show off your Christmas tree through your big bay window, you may be showing off all those expensive gifts, too. Don’t give thieves an incentive. Take extra time to double check. Helping your child find the bow tie that goes with their choir uniform or remembering to grab all the food that you volunteered to bring to a party can leave you completely distracted and forgetful. To make sure that you don’t come home to a problem, take one extra minute to double check that the oven is off, the doors are locked, and your home is secure. Update your locks. If your locks don’t seem to be working or you feel they weren’t installed properly, invest in rekeying your house, along with other locksmith services for your home. A deadbolt that isn’t properly working is just as bad as not having one to begin with. Keep Christmas gifts off our porches. Pick up your packages as soon after they are delivered when you can. Unfortunately, there are those with hearts two sizes too small that steal packages off porches. There isn’t much you can do to avoid this. However, if you have your gifts delivered to your work address or come home for lunch to pick them off your porch, you can avoid the heartbreak of missing packages. Not sure if you have the best security for your home or ready for electronic locking systems? Contact Affordable Locksmith of Texas, your local locksmiths for the Spring and The Woodlands area. We are licensed, have the knowledge, experience, and tools to perform the task you need. Locked out? Call or contact us and we get back to you with a solution for your situation in 15 minutes or less.